MPC's Anodized Aluminum Foil Labels, ID Tags and Custom Foil Stickers are designed for durability and longevity in demanding environments for all types of equipment. Strong and lightweight, anodized aluminum foil labels work well in nearly any indoor application, as well as harsh industrial applications where abrasives may be present. 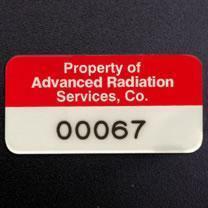 Anodized aluminum foil labels and tags are a popular choice for asset tracking and product identification labels, property ID tags, instructional labels, safety and warning labels, schematic diagrams, machine data labels, and more. Our anodized aluminum labels are available as blanks to mark on-site, or with pre-printed information. Why Choose MPC's Anodized Aluminum Foil Labels, Stickers and Tags? Images on all foil labels and tags are sealed beneath an anodic layer for increased durability and weather resistance. Label will fracture if removed from its mating surface, providing extra security. Available as blanks, with static data, or with variable data such as sequential numbers, serial numbers and bar codes. Anodized aluminum face stock in .003", .005", and .008" thicknesses. Matte (non-reflective with flat finish), Satin (lustrous semi-reflective material).